Indonesian President Susilo Bambang Yudhoyono creates a national agency aimed at combating greenhouse gas emissions. 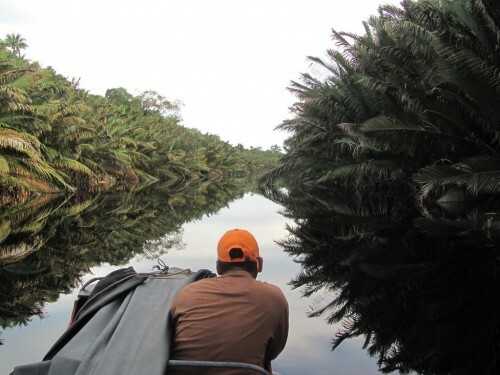 To Enact: PRESIDENTIAL DECREE REGARDING THE MANAGING AGENCY FOR THE REDUCTION OF EMISSION FROM DEFORESTATION AND DEGRADATION OF FOREST AND PEATLANDS. 1. Reducing emissions from deforestation and forest degradation in which from herewith shall be referred to as REDD+ refers to all efforts to reduce emission of greenhouse gases from deforestation and degradation of forest and peatlands carried out on forested land and peatlands in Forest Area and non-Forest Area and carbon maintenance and improvement with the added benefit of the increase of biodiversity, the improvement of local/indigenous people’s welfare and the increase of sustainability of other production of ecosystem services. 2. Safeguard framework is a collection of criteria and indicators to ensure the implementation of REDD+ does not deviate from its original objective related to program management and financial accountability, impact to the social relation and position of vulnerable communities, and impacts to the environment. 3. REDD+ Program are efforts implemented through a series of projects and/or activities to achieve REDD+ objective in Indonesia. 4. REDD+ Project is one or more activities managed by a certain administrative unit to achieve REDD+ objective in Indonesia. 5. REDD+ Activity is an activity managed by a certain legal subject to achieve REDD+ objective in Indonesia. 6. Emission of Greenhouse Gases from herewith will be referred to as GHG Emissions is the release of greenhouse gases to the atmosphere in a certain area for a certain period of time. 7. GHG are gases in the atmosphere be it natural or anthropogenic, that absorbs and radiate back infrared radiation. 8. Deforestation is permanent change from forested area to non-forested area. 9. Forest degradation is the decrease in quantity of forest cover and carbon stock in a certain period of time. 10. Forest Area is a certain area designated by the government to be maintained as permanent forest. 11. National Strategy to Reduce Emissions from Deforestation and Degradation of Forest and Peatlands from herewith will be referred to as REDD+ National Strategy is the document containing main strategy guidelines and planning direction as stipulated by the Government that will be used as reference by all parties concerned in the preparation and implementation of REDD+ activities. 12. Government is the President of the Republic of Indonesia that governs the Republic of Indonesia as stated in the 1945 Constitution of the Republic of Indonesia. 13. Funding Instrument is a fund management instrument formed by the Head of REDD+ Managing Agency to guarantee fund management that is transparent, accountable and effective based on REDD+ funding guidelines and safeguards in accordance to prevailing law. d. provide benefit to the increase of environmental services, biodiversity, and local/indigenous community welfare. (1) To implement objectives as referred to in Article 2, by way of this Presidential Decree will be formed a Managing Agency for the Reduction of Emission from Deforestation and Degradation of Forest and Peatlands that herewith will be referred to as the REDD+ Managing Agency. (2) REDD+ Managing Agency will be situated in the Capital of the Republic of Indonesia. (3) REDD+ Managing Agency will be lead by a Head that is directly responsible to the President of the Republic of Indonesia. REDD+ Managing Agency is tasked to help the President in coordinating, synchronising, planning, facilitating, managing, monitoring, overseeing and controlling REDD+ in Indonesia. m. Carrying out other tasks assigned by the President. (2) Deputies is directly under and directly responsible to the Head of the REDD+ Managing Agency. (3) Professional Staffs as referred to point (1) letter c, consist of Expert Assistants, Assistants, Junior Assistants and Skilled Staffs, all totalling not more than 60 (sixty) people. (4) In carrying out their tasks, function, and authority, the Head of the REDD+ Managing Agency can form special teams or task force to address particular issues. Details of tasks and function of Deputies and Professional Staffs referred to in Article 6, will be determined later by the Head of REDD+ Managing Agency bearing in mind tasks and function of the REDD+ Managing Agency stipulated in this Presidential Decree. (1) In providing technical and administrative support to the REDD+ Managing Agency, a REDD+ Managing Agency Secretariat will be formed. (2) The REDD+ Managing Agency Secretariat as referred to in point (1) is lead by a REDD+ Managing Agency Head Secretary and will be under and directly reponsible to the Head of the REDD+ Managing Agency and administratively coordinated by the Minister-State Secretary. (3) REDD+ Managing Agency Secretariat is tasked with providing administrative and technical support in implementing tasks and function of the REDD+ Managing Agency. (5) REDD+ Managing Agency Secretariat will at most consists of 3 (three) Sections. (6) Each Parts as referred to in point (5) will at most consists of 2 (two) Sub-Sections. (1) REDD+ Managing Agency Head Secretary is a structural position of echelon IIa. (2) Head of Section is a structural position of echelon IIIa. (3) Head of Sub-Section is a structural position of echelon IVa. Echelon II, echelon III, and echelon IV staffs at the REDD+ Managing Agency Secretariat are appointed and dismissed by the Minister-State Secretary with recommendation of the REDD+ Managing Agency Head. (1) Head of the REDD+ Managing Agency is appointed and dismissed by the President. (2) Deputies are appointed and dismissed by the President with recommendation of the Head of the REDD+ Managing Agency. (3) Professional Staffs, Special Teams and Task Force within the REDD+ Managing Agency are appointed and dismissed by the Head of the REDD+ Managing Agency. Deputies and professional staffs within the REDD+ Managing Agency can be civil servants or non-civil servants. (1) Civil servants appointed as staffs of the REDD+ Managing Agency will be resigned from their organic workstations during their term within the REDD+ Agency without losing their status as civil servant. (2) Civil servants appointed as staffs of the REDD+ Managing Agency will be granted promotion in accordance to prevailing regulations. (3) Civil servants as referred to in point (1) bear the status employed. (1) Civil servants that resigned or ended their service as staffs of the REDD+ Managing Agency will be activated again to their previous workstations, when they have not reach their retirement age. (2) Civil servants that resgined or have reached their retirement age will be dismissed with honour as Civil servants and will be given their rights for their service in accordance to prevailing regulations. Non-civil servant staffs of the REDD+ Managing Agency, after resgining or ended their service period will not be granted pension and/or severance pay. Head of the REDD+ Managing Agency will be provided with financial, administrative rights and other facilities at par with Ministers. (1) Deputies will be granted position, financial rights and other facilities at par with structural echelon Ia official. (2) Professional Staffs, that are appointed as Expert Assistants, will be granted position, financial rights and other facilities at par with structural echelon Ib official. (3) Professional Staffs, that are appointed as Assistants, will be granted position, financial rights and other facilities at par with structural echelon IIa official. (4) Professional Staffs, that are appointed as Junior Assistants, will be granted position, financial rights and other facilities at par with structural echelon IIIa official. (5) Professional Staffs, that are appointed as Skilled Staffs, will be granted position, financial rights and other facilities at par with structural echelon IVa official. Provisions related to work procedure, relations and working coordination mechanisms of the REDD+ Managing Agency with Ministries/Agencies, Provincial Heads and Head of Regencies/Municipalities and other stakeholders are determined by the Head of the REDD+ Managing Agency. Head of the REDD+ Managing Agency will report at least once every 6 (six) months to the President of the Republic of Indonesia or any time required. In order to institutionalise the involvement of stakeholders, a Stakeholder Committee will be formed and will be under and directly responsible to the REDD+ Managing Agency. The Stakeholder Committee is tasked with providing advice and suggestions to the Head of the REDD+ Managing Agency regarding implementation of REDD+ Programs, Projects and/or Activities based on requests or the Committee’s initiative. (2) Members of the Stakeholder Committee are appointed by the Head of the REDD+ Managing Agency for 2 (two) years of service period and can be extended for 1 (one) period. (3) Members of the Stakeholder Committee are not staff of the REDD+ Managing Agency. (3) Further provisions on REDD+ funding instrument as referred to in point (1) will be stipulated by law. (4) Verification process of GHG emission and squestration from REDD+ programs, projects and activities will be conducted by the minister that governs environmental protection and management. All funding needed for the implementation of tasks and function of the REDD+ Managing Agency will be sourced from the National State Budget, Regional State Budget, and other legal and unbinding sources, in which dispensing will be carried out in accordance to prevailing law. Head of the REDD+ Managing Agency will be responsible to equip the REDD+ Managing Agency organisation by conducting recruitments, empowerment and training of Professional Staffs and other staffs as needed. (1) Tasks, function and programs carried out by the Task Force for the Preparation of the REDD+ Agency formed under the Presidential Decree Number 25 of 2011 on Task Force for Preparing the Establishment of REDD+ Agency as amended by Presidential Decree Number 5 of 2013 will be continued by the REDD+ Managing Agency. (2) Before the complete formation of the organisational structure of the REDD+ Managing Agency, tasks and function as referred to in point (1) will be carried out by President’s Delivery Unit for Development Monitoring and Oversight . This Presidential Decree comes to effect on the date issued. To be known by everyone, orders the issuance of this Presidential Decree to be placed in State Gazette of the Republic of Indonesia.